Barry Ballance started his law enforcement carer in 1987 after completing the MJC Academy. 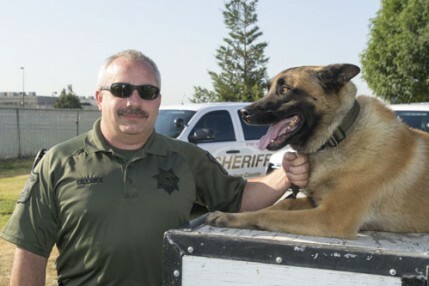 In 1997 he started with the Stanislaus County Sheriff's Department. Shortly after, he joined the Sheriff's Department's Bomb Squad and is still a member of the team. In early 1999 Deputy Ballance was assigned to the K9 Unit and partnered with his first K9, Pepa, a German shepherd from the Czech Republic. After his first K9 retired, K9 Sergo and Deputy Ballance became a team. K9 Sergo was a Belgian Malinois. During K9 Sergo's carer they competed in numerous K9 trials throughout Northern California. They managed to finish overall in the top 5 for the year, five years in a row. Deputy Ballance's third partner was a Belgian Malinois named Cody. The money to purchase him was donated by the Moore family of Modesto. Their son, Cody Moore was in the Army and died while serving. K9 Cody was responsible for numerous arrests and was well known at the local schools. Deputy Ballance's current partner is from Yugoslavia. He is a 4 year old Belgian Malinois named Lykan. They have been partners for the past 2 years. K9 Lykan is trained for patrol and narcotics. The patrol functions include searching for criminals who have run from deputies, tracking people and crowd control. He sniffs for narcotics in vehicles and buildings. Deputy Ballance and K9 Lykan plan on retiring together in the next few years.